When it comes to cookies that have nuts in them, personally I’m a big fan. Not everyone is a big fan of nuts in their cookies and desserts, but one thing I have noticed is that it’s been almost impossible to find someone that does NOT like almond extract flavoring…even the people who don’t like almonds or nuts in general. Preheat oven to 350 degrees. Cream the butter, white and brown sugar together using electric mixer. Add eggs, almond extract and vanilla, beat until combined. Add flour, salt and baking soda, mixing well. 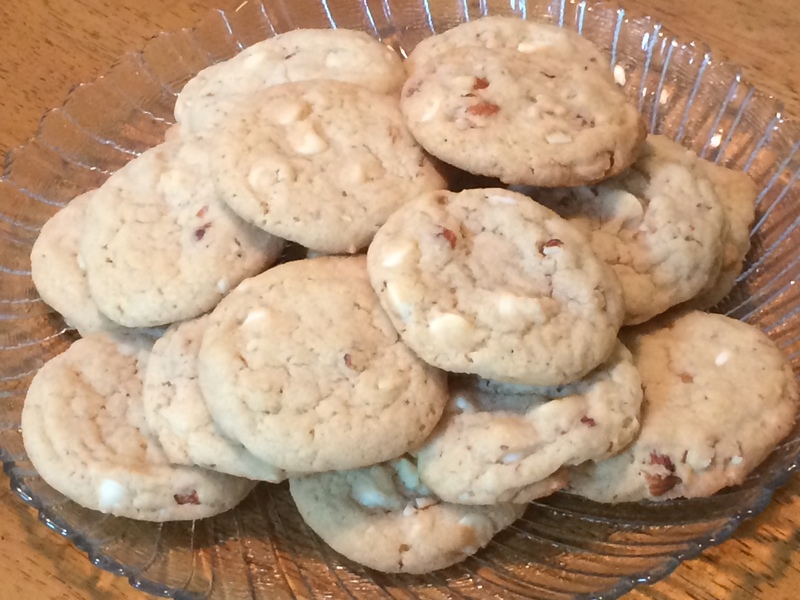 Stir in white chocolate chips and almonds. Using a cookie scoop, scoop out dough and distribute on baking sheet and bake for approximately 12 minutes, until tops of cookies are a very light brown. Cool completely on cooling racks, store in airtight container. **If you’re toasting your own almonds, it’s very simple… Just lay them out on a baking sheet and bake for 5-6 minutes at 350 degrees, let cool before chopping into chunks.